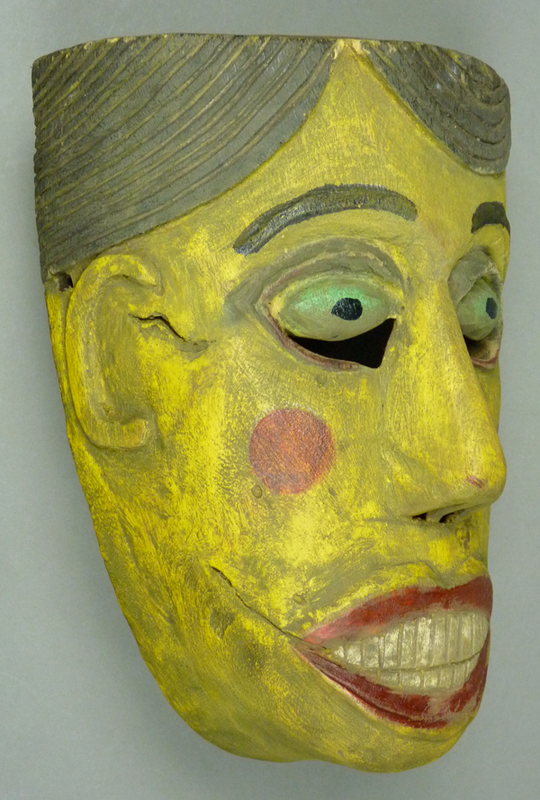 The mask is 10 inches tall, 6½ inches wide, and 6 inches deep. It has a dramatic face with exaggerated features. 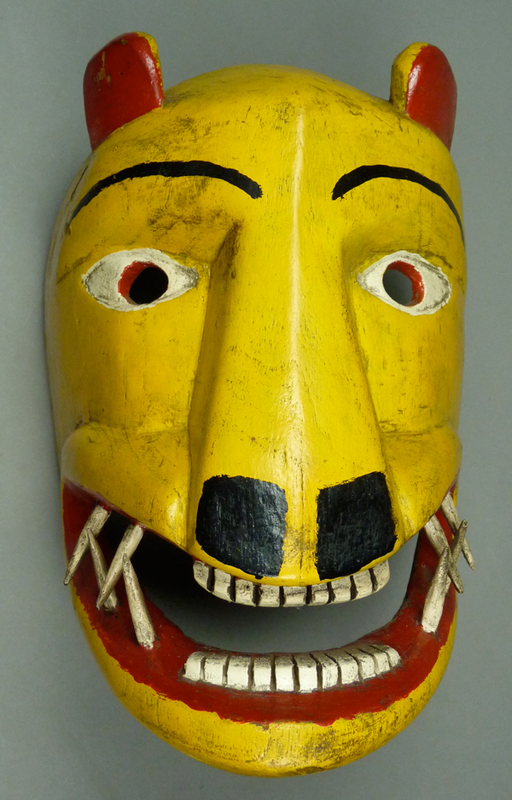 In addition to the sweeping curve of the back edge, the eyes and the teeth resemble those on other Modesto masks. 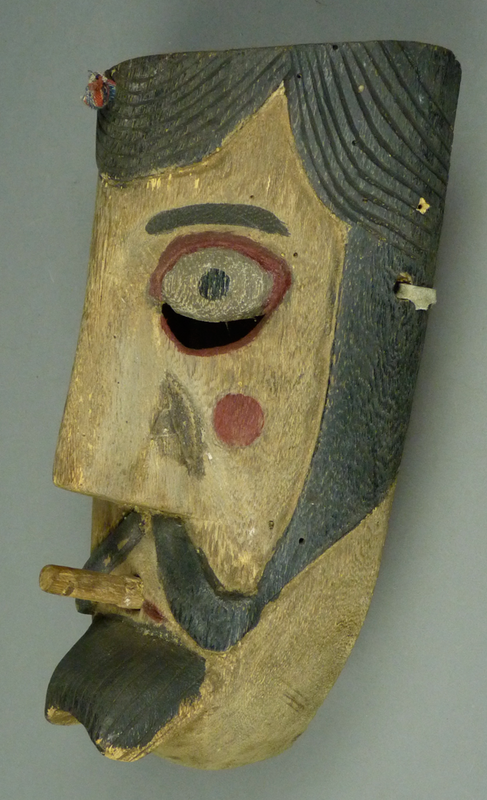 Another clue that points to Modesto Sanchez is the sculptural management of the face. For example, look at the shaping of the nose and ears—so abstract and unrealistic. The back shows excellent wear. 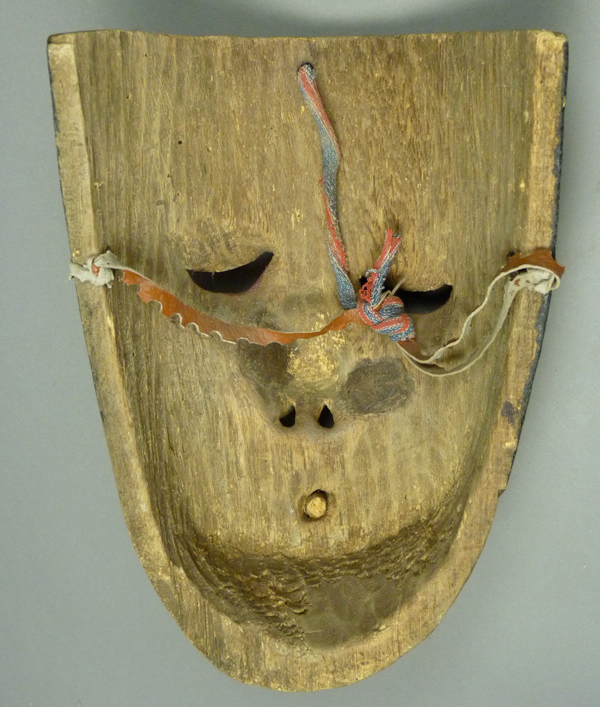 The teeth were cut through to the back, just as we saw on the female mask in last week’s post. In November of 1998, when I bought the Werewolf and this Vampire from Jaled and Estela, Jaled told me that the Vampire was found in Huayacocotla, Veracruz and that both were carved by the same carver. Therefore the Vampire must have also been carved by Modesto Sanchez. This is not immediately apparent if one focuses on the shaping of the sides and the back of the Vampire, but it becomes more obvious when one compares noses. 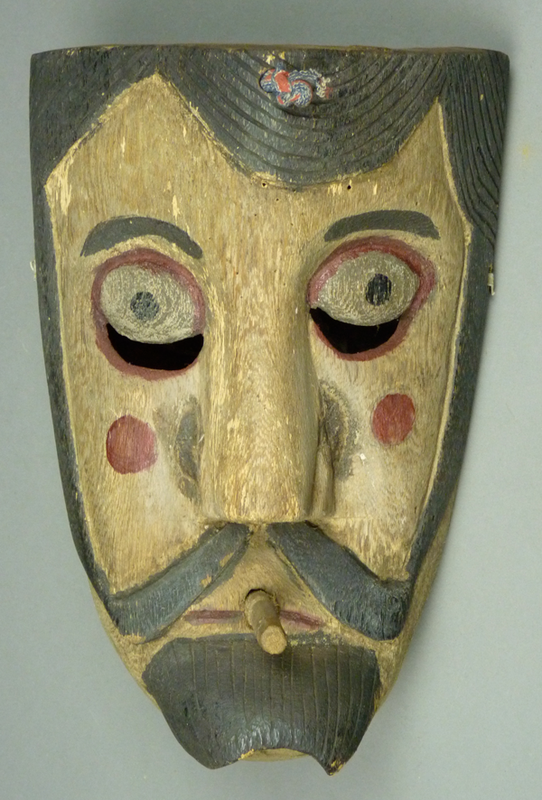 Although Modesto never makes the same nose twice, if one compares the Vampire’s nose to those on all four of the masks in last week’s post, they do conform to a similar pattern. The artfully abstract quality of the carving of the ear and the surrounding hair provides further evidence of Modesto’s hand. At a more concrete level, since this is a vampire mask, the mouth has fangs. On reflection, the most wonderful detail is the groove down the middle of the nose, an alarming deformity that defies anatomy; the cartilage that supports the nasal ridge is shaped like a thin blade and could never be grooved. 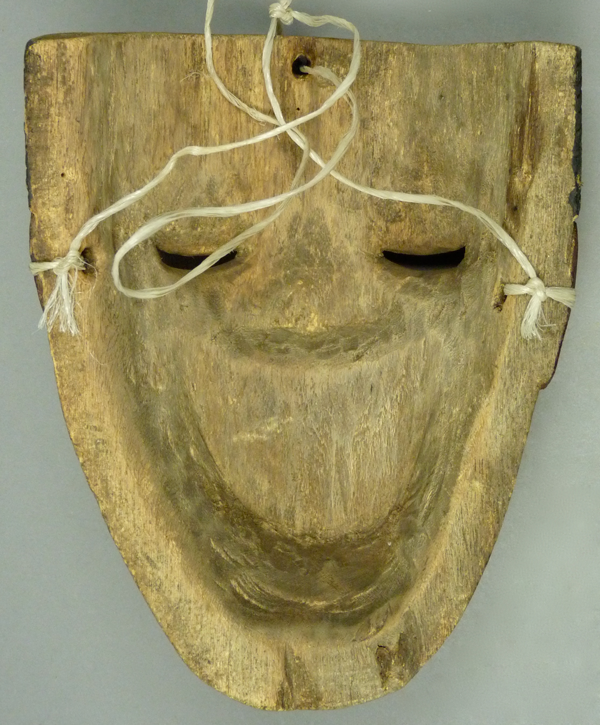 This mask is 7½ inches tall, 7¼ inches wide, and 5¼ inches deep. The staining on the back demonstrates moderate wear. 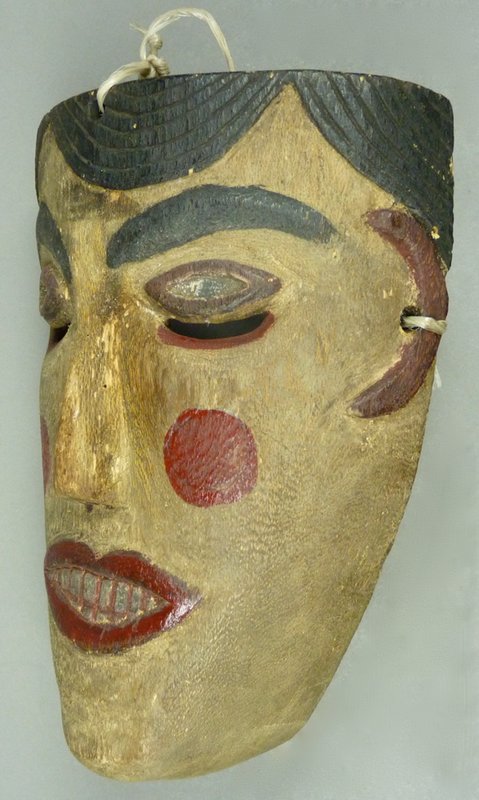 This mask has the forehead staple that is commonly found on the Mojíca masks. 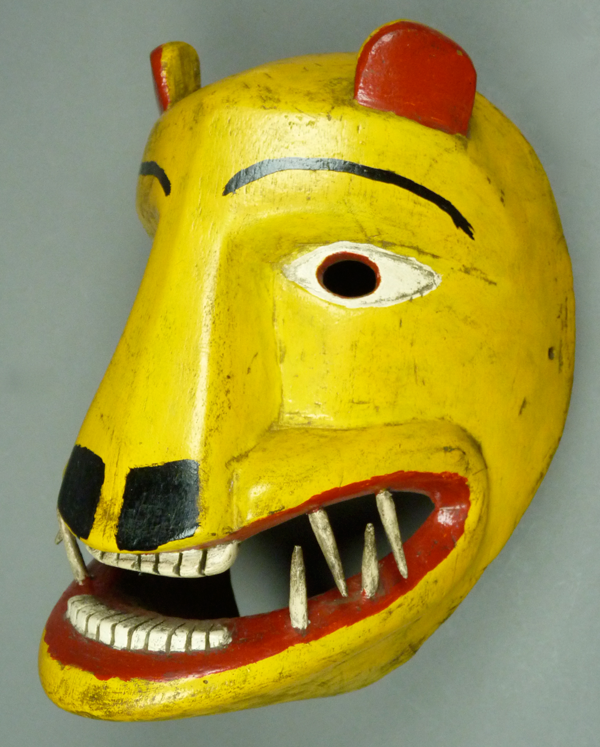 For the rest of this post I will discuss a set of three masks that were collected together in Huayacocotla by Jaled Muyaes and Estela Ogazón. Like many others from that town, these three masks are unusually large. They are decidedly not in the style of Modesto Sanchez, but rather they are in another style that is attractive and unusual. 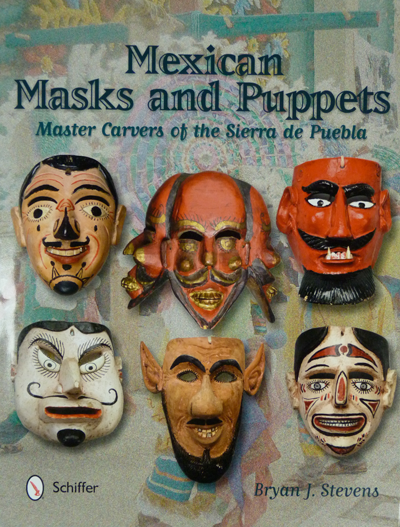 They too were used in Carnaval, and they represent Hernán Cortéz and two versions of his consort, Malinche. Here is Cortéz. The cigarette is removable, and fits into an opening that was clearly designed to accept it. 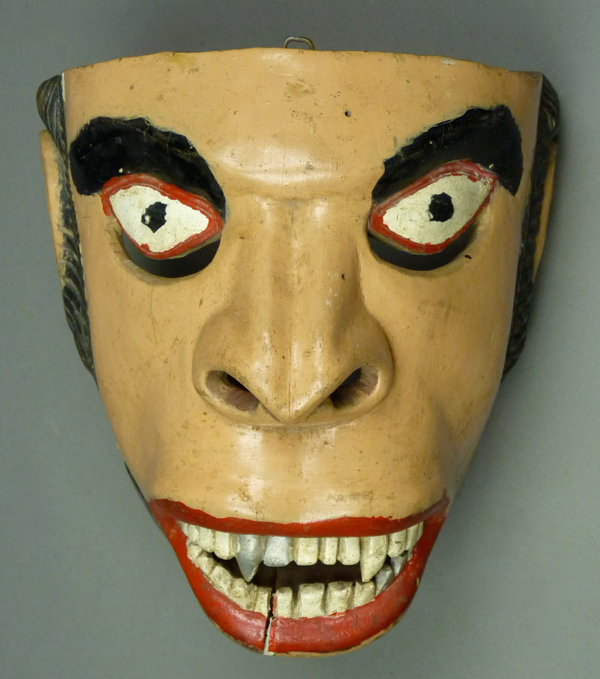 This mask is 11 inches tall, 7½ inches wide, and 4 inches deep. The back may have been treated with some stain, or it is very dark from extensive use. Several weeks ago we saw a Cortéz and Mojíca pair with these ears; that Mojíca had a monkey face. 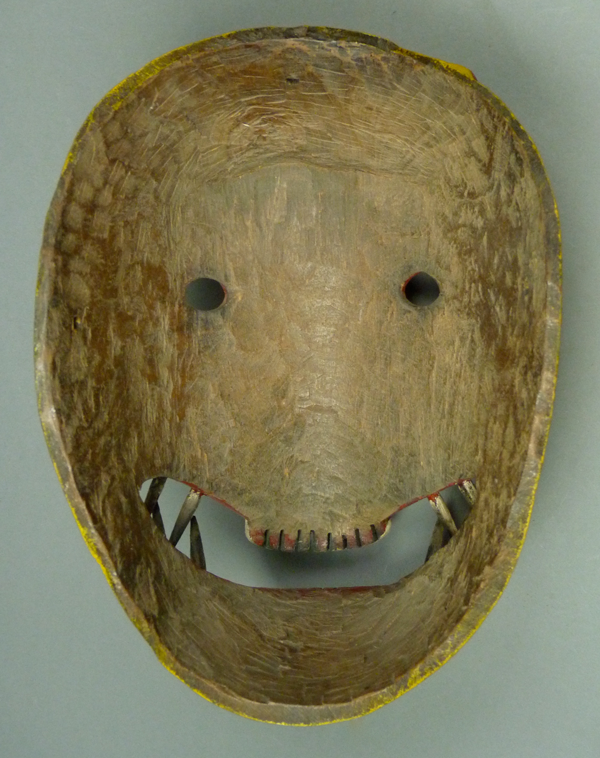 This mask is 9 inches tall, 7 inches wide, and 3 inches deep. 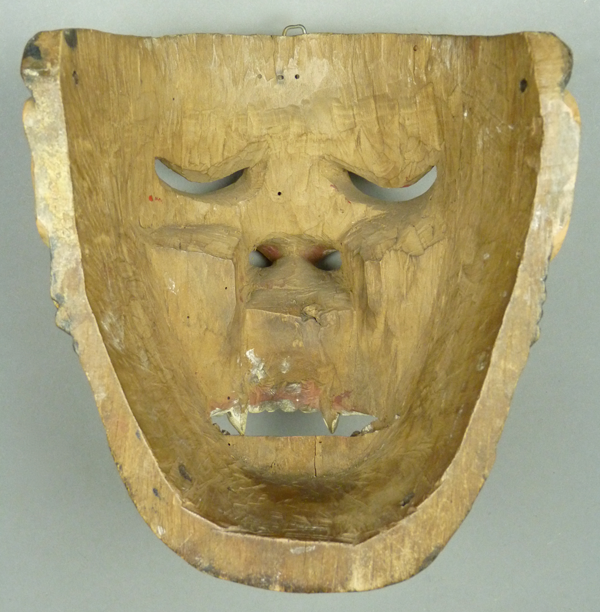 This mask also has a heavily stained back. 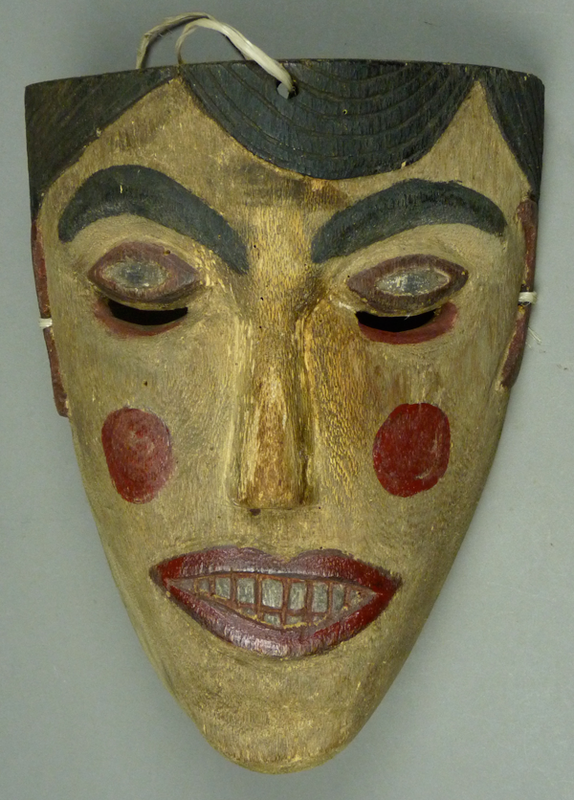 Here is a second Malinche; one gathers that her yellow complexion signifies that she is somehow different—dead, loco? Her appearance is wonderfully outrageous, complete with blue eyeballs. 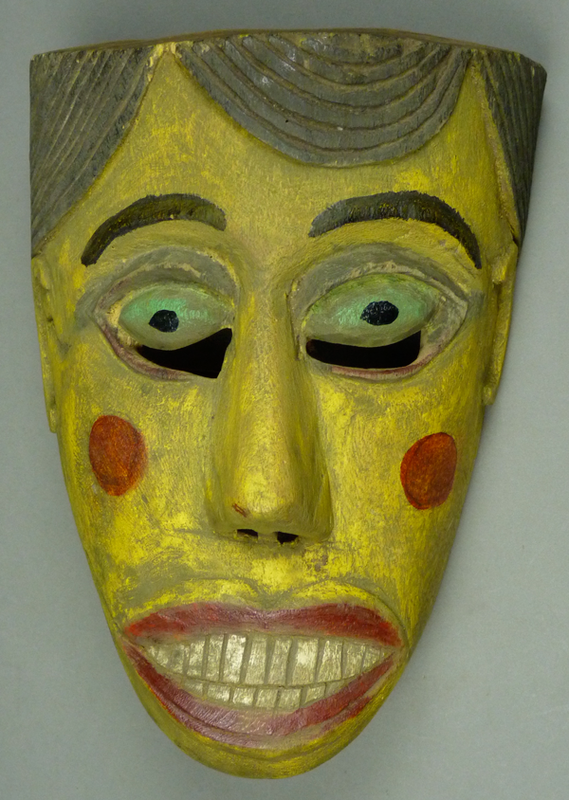 This mask is 10 inches tall, 7¼ inches wide, and 4 inches deep. 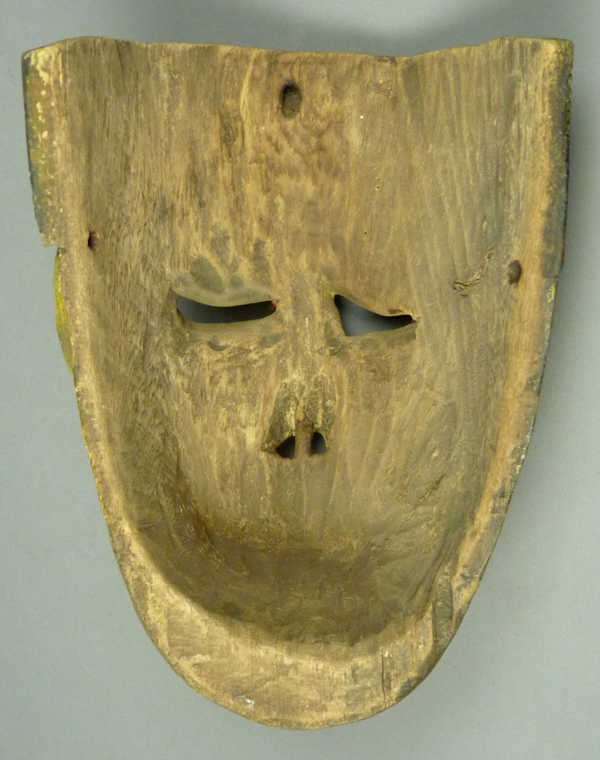 The back of this mask demonstrates heavy staining from use. 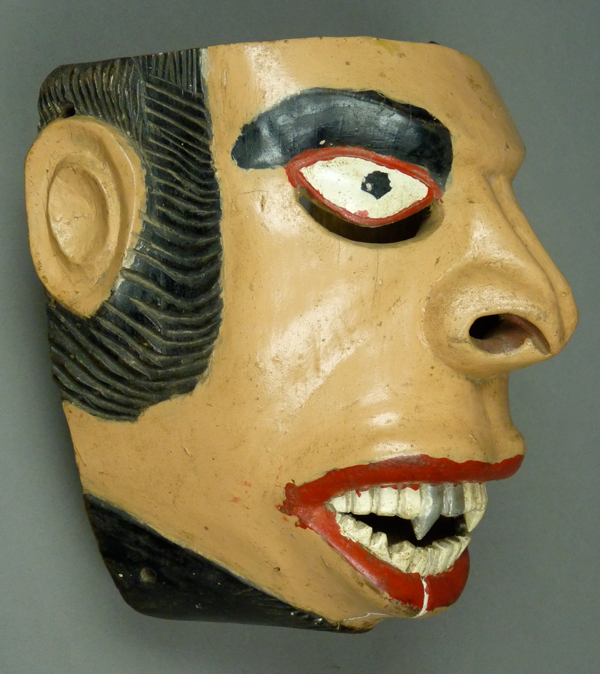 Next week we will examine some Moro masks from Veracruz.